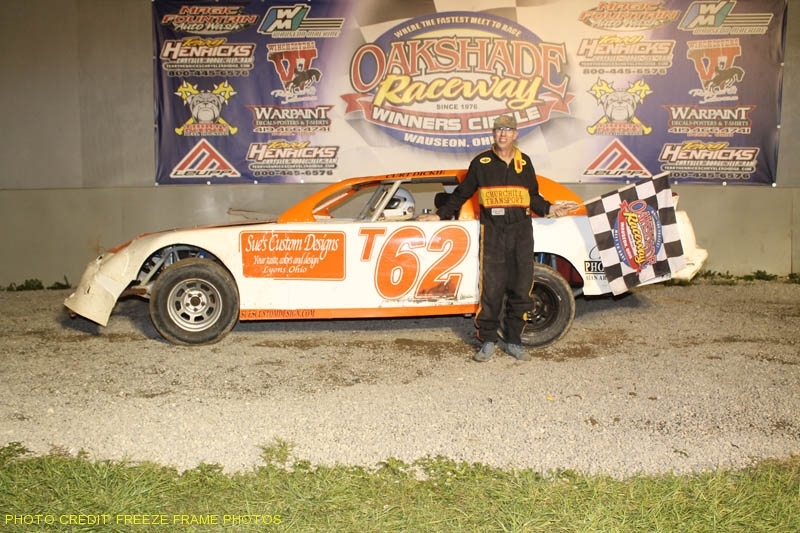 Chris Keller made a clean sweep of the Oakshade Raceway Sportsman Twin 25’s on Saturday night with impressive wins in both 25-lap feature events. Last week’s Sportsman feature winner, Bruce Stuart, started on the pole and led the first half of the race. An incident that involved Billy Brown and Bob Krumm on the backstretch brought out the caution flag on lap nine. Keller was third on the restart behind race leader Bruce Stuart and Mike Jessen. A few laps later, Keller took the lead and didn’t look back as he went on to pick up his first feature win of the year. Stuart finished second with Tim Fisher in third after starting 15th. Tim Line and Joe Derbeck rounded out the rest of the top five finishers. The Sportsmen drivers would then got a break before the second 25-lap feature as the UMP Late Model and Bomber A Main were run before they came back on the track. J.R. Hotovy grabbed the early lead in the UMP Late Model feature, but pole-sitter Casey Noonan battled back and after a couple laps of side by side racing, Noonan finally took the top spot. After stretching out a bit of the lead over the rest of the field, Noonan began to feel pressure from Jon Henry who had closed in by lap 14. Henry assumed the lead just as the caution flag flew for an incident involving Dan Wallace on lap 19. Rusty Schlenk worked his way up to the second position by lap 20 after starting 16th, but Henry was able to fend him off to pick up his fourth Oakshade feature win of the year. Schlenk settled for second ahead of Noonan, Hotovy and Josh Scott. Next on the track was the UMP Bomber A Main. Jeff Foks Jr. celebrated the birth of his daughter earlier in the week and led most of the feature race after starting on the pole. Last week’s A Main winner Danny Hogrefe spun on lap six to bring out the first yellow flag of the race. Bomber point leader Jim Scout worked up to second by lap nine and then closed in on Foks. Scout got to the inside of Foks with just two laps to go, but a crazy series of events on the final lap completely changed the complexion of the race. The caution flag flew for a debris on the track and at the same time, Jeff Foks and Jim Scout both spun entering turn three. Also caught up in the incident was the third place car of Tony Tolles. All three had to restart at the tail. Terry Rushlow suddenly found himself as the leader, but Chris Henry took the lead on the backstretch on the final lap. Rushlow battled back to his inside in turn four and won the drag race back to the checkered flag to pick up his first feature win of the year. Henry finished second and Jeff Geis closed to within 13 points on Jim Scout in the point standings with his third place finish. Curt Lancaster was fourth with Adam Noonan finishing fifth. The UMP Sportsman were set to battle for another 25 laps next and Chris Keller had drawn for 10 cars to be inverted for the start, which meant he would be starting in the middle of the field. The invert put Rusty Smith on the pole and he took advantage by leading the first eight laps of the race. Keller marched all the way up to second by lap six. Mike Jessen spun on lap eight to bring out the caution flag and Keller took the lead just after the restart. He began to open up his lead, but another spin by James Fox tightened up the field on lap 19. Point leader Tim Line got to restart in second right behind Keller, but Keller was able to hang on to win his second feature of the night. Line was second followed by Tim Fisher, Bruce Stuart and Bob Gregory. Derek Morris continued his dominant streak in the Oakshade Hornet class with his third feature win in a row to close to within 29 points on Drew Smith in the point standings. Morris started on the outside of the front row and led the entire distance with Smith settling for second. Brandon Myers, “Sparky Marky” Gillingham and Logan Hough had a good battle for third with Gillingham coming out on top to finish third. Hough was fourth and Myers ended up fifth. Great feature racing action continued with the UMP Bomber B Main that featured Karl Spoores, Chuck Leininger and Kyle Light three-wide for the lead on the first lap. Spoores eventually came out on top of that battle and Light ended up spinning on lap six to bring out a caution. Spoores held on to win his first feature of the year followed by Jim Remley, Chris Dachenhaus, Steve Morris and Chuck Leininger. Fred Burtch held off an early challenge from Josh Sisty in the UMP Bomber C Main, but that victory was short-lived. Mark Shultz drew a caution flag on lap two after stopping on the track. Sisty took advantage and snatched the lead away from Burtch on the restart. Sisty opened up a bit of the lead, but Burtch began to chip away at it and reeled in Sisty on the final lap. Sisty was able to hang on to pick up the victory with Burtch finishing a close second. Tommy Wilhelm was third followed by Craig Holland and Tim McNicol. Oakshade Raceway continues to be the best value for your racing dollar with the American Late Model Series event highlighting the August 6th racing program. $2,000 will be awarded to the Late Model feature winner. UMP Sportsmen, UMP Bombers and Hornets will also be in action. Gates will open at 4pm with racing at 7pm. A heavy downpour shortly before race time at Oakshade Raceway delayed the start of racing, but it didn’t dampen the smiles on at least 46 kids who went home with new wheels (bicycles, tricycles, scooters, etc.) on the “Night of Wheels.” It also made for some extremely fast racing with Rusty Schlenk finding his way to victory lane for the fourth time this year at Oakshade. Brian Ruhlman won his heat race convincingly earlier in the night and started on the pole of the UMP Late Model feature. He darted out to the lead over Josh Scott leaving Scott to battle with Schlenk for second. Schlenk disposed of Scott and then tracked down Ruhlman making the pass for the lead on lap five. Schlenk led the rest of the way with Jon Henry trying to reel him in the last half of the race. Henry ended up in second with Ruhlman slipping back to finish third. Ryan Missler was fourth and Rick Delong was fifth. Tim Line led early in an ugly UMP Sportsman feature event that was marred by multiple wrecks, including one that involved half the field. Tim Fisher and Brice Luttrell got together on lap three which stacked things up behind them in one of the incidents. Bruce Stuart got by Line for the lead on the restart, but the yellow would fly on lap four for an incident involving seven cars. The big wreck happened one lap later that just about blocked the entire track exiting turn two with 10 cars. Stuart survived to pick up his first feature win of the season with point leader Tim Line finishing second. The rest of the top five were Mike Jessen, Joe Derbeck and George Lindsey. Tony Tolles passed Danny Hogrefe off turn two on the first lap to take the lead in the UMP Bomber A Main. The first yellow flag came out on lap six when Greg Whitehead spun in turn three and collected five other cars. A couple laps after the restart, Hogrefe went by Tolles on the outside to regain the lead and managed to fend off Tolles and Chris Henry to earn his first A Main feature win of the year. Henry got by Tolles for second. Finishing behind Tolles in fourth was Joe Overmyer and Jim Scout, who started back in 16th. The only feature race to go completely caution free was the one for drivers 18 and under. Sporting a new number, Derek Morris got by Logan Hough for the early lead in the Hornet feature race and never looked back. Morris went on to pick up his fourth feature win of the year and closed to within 31 points on point leader Drew Smith who mustered a fourth place finish after started last. Logan Hough finished second with pole-sitter Troy Schalitz winding up third. Brandon Myers was the fifth place finisher. Joe Heffner started on the pole of the UMP Bomber B Main, but his night was cut short after spinning on the exit of turn two in front of the entire field. Most cars were able to get by, but Derek Dusseau, who was further back in the field, plowed hard into Heffner. That ended both drivers’ night. Dan Bleikamp led the entire distance of another caution-filled feature and held off Steve Morris and Josh Montague on a one-lap shootout finish after the race time limit had expired. Morris was involved in one of the earlier cautions and had to restart at the tail, but worked his way back to a second place finish followed by Montague, Fred Burtch and Shaun Sharp. The Sportsman Twin 25’s will be the featured event on Saturday, July 30 at Oakshade Raceway with two 25-lap feature events. UMP Late Models, UMP Bombers and Hornets will also be in action. Gates open at 4pm with Racing at 7pm.